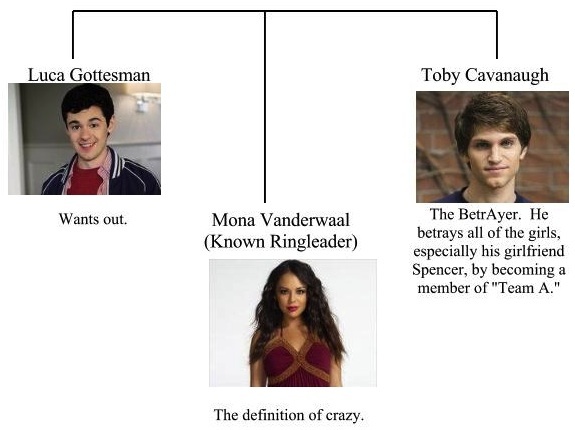 Okay, Little Liars, let’s face it. We’ve all had that moment: the one where you try to explain “Pretty Little Liars” to someone who hasn’t seen the show. In that moment, it seems like explaining quantum physics would be easier. If you’ve ever wondered how to explain this complex yet wonderful show, you’ve come to the right place! Set in the stereotypical suburb of Rosewood, PLL revolves around the mysterious “A.” No one knows who “A” is, but “A” knows who everyone is and what they’re doing. 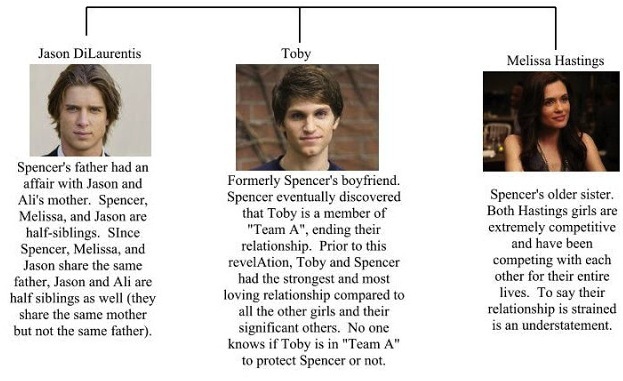 “A” is also more than just one person; “Team A” is a group of people whose sole purpose is to destroy the lives of four best friends — Aria Montgomery, Hanna Marin, Spencer Hastings and Emily Fields — just as they destroyed the life of their former best friend Alison DiLaurentis. In fact, “A” might have played a part in Ali’s death. Known Members of “Team A"
The N.A.T. was a club that filmed videos of many teenage girls in Rosewood, similar to how “A” watches all of the girls. N.A.T. stands for “Nos Animadverto Totus,” meaning “we see all” in Latin. The members of this club may have something to do with Ali’s death, but several members have been killed or have gone into hiding. 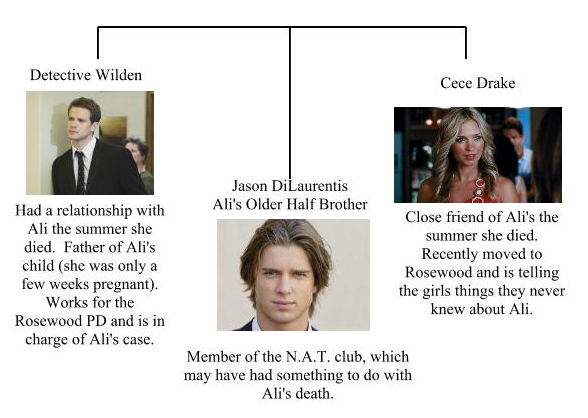 Ali was killed one summer, and the girls (Aria, Hanna, Spencer and Emily) are trying to find out who killed her. Little by little, the girls learned that “A” was also torturing Ali, and Ali was trying to figure out who “A” was, or is. When she was alive, Ali wasn’t a kind person, so pinning down who would want to hurt or kill her is no easy task. Aria is known as the artistic and more free-spirited one of the girls. “A” had a major hand in destroying her parents’ marriage and nearly destroyed her relationship with Ezra as well. From the outside, it would seem like stereotypical popular girl, Hanna, has everything. However, “A” has impacted her the most— Mona was formerly her best friend. Even though Mona and Hanna were best friends, that didn’t stop Mona from running Hanna over with a car or wreaking havoc on her life. The brainiac of the group, Spencer is leading the girls in their mission to find and take down “A.” Spencer is a natural leader, so when Ali was alive, she often challenged Ali’s leadership position, which created a lot of tension between the two girls. She is also naturally competitive, so she has turned finding “A” into a competition. Emily is the most athletic girl in the group as well as the most soft-hearted. She is a lesbian and was in love with Ali. Emily has faced a lot of problems, some of which were not directly caused by “A,” such as the death of Maya St. Germain, her former girlfriend, and almost being killed by Maya’s psychotic ex-boyfriend.